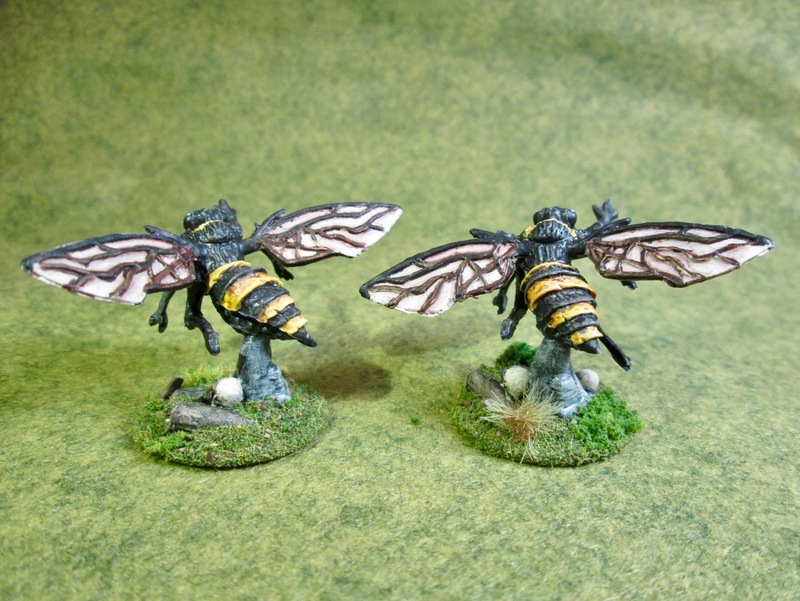 Fly Demons Painted as Giant Bees: Bones 2 Figures | H.A.W.K.S. 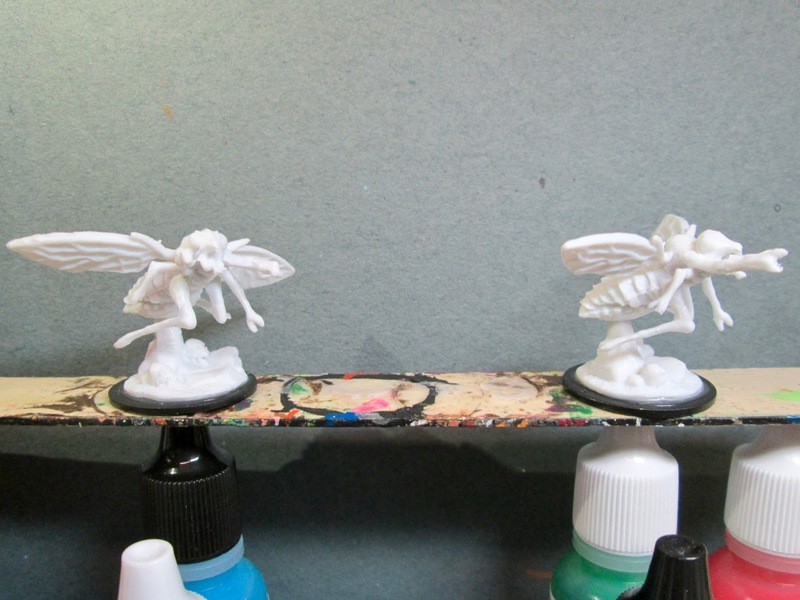 This past week I painted two of the Fly Demons from the Bones 2 Lesser Demons set, as part of my effort to start assembling the creatures I will need for next year’s Ghost Archipelago Campaign. 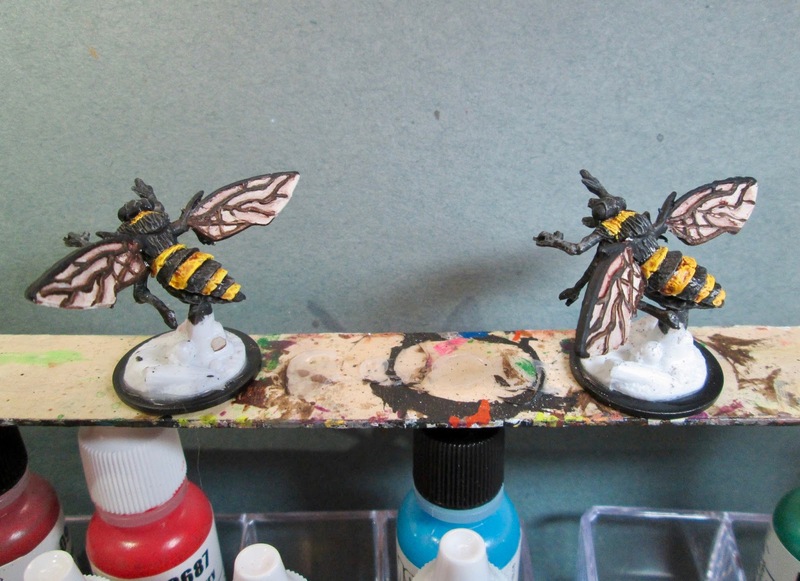 The rules’ creature list calls for a couple of Giant Wasps; but not having any giant wasp figures on hand, I figure the Bones Fly Demons I had would fit the bill well enough if I painted them as Giant Bees. I prepped these figures in the usual way; soaking them in a dish of water with a couple drops of dish-soap added, then giving them a light scrub with a soft toothbrush, and then rinsing and drying them. I then did the conversion work, and then glued the figures to black-primed 1" fender washers with Aleene’s Tacky glue, and then glued the washer-mounted figures to a tongue depressor with a couple drops of the Elmer’s glue under each washer. 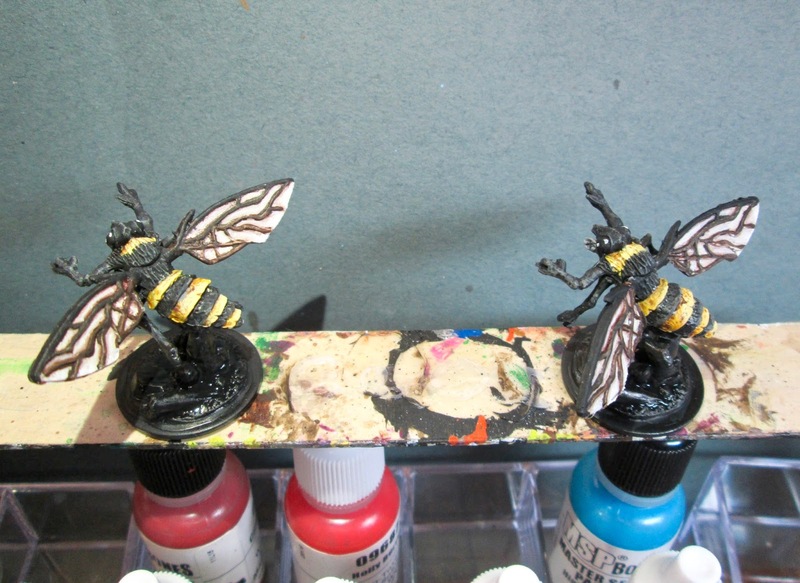 I began by painting the bees’ heads, undersides, and alternating stripes on their abdomens using Black. When the Black was dry, I drybrushed it with Americana “Neutral Grey”. 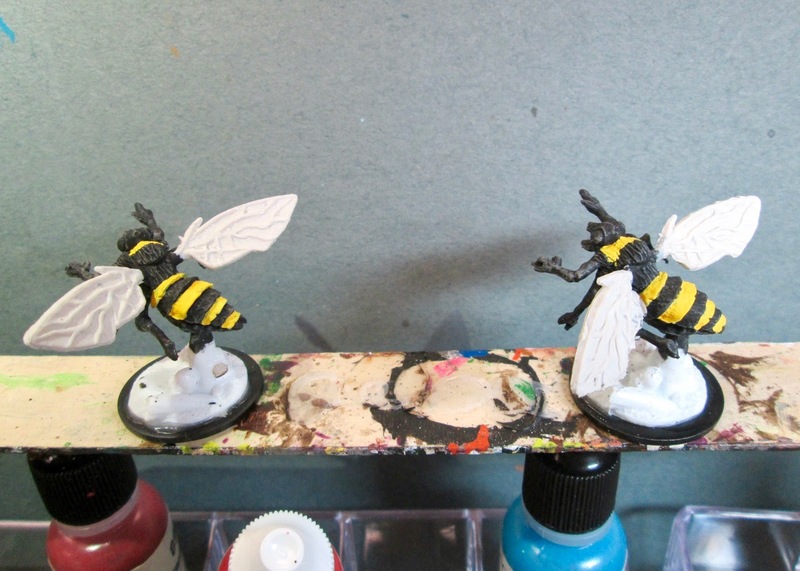 I then painted the unpainted alternate stripes on their abdomens with Apple Barrel “Yellow”. Next, I painted the wings with Americana “Dove Grey”. 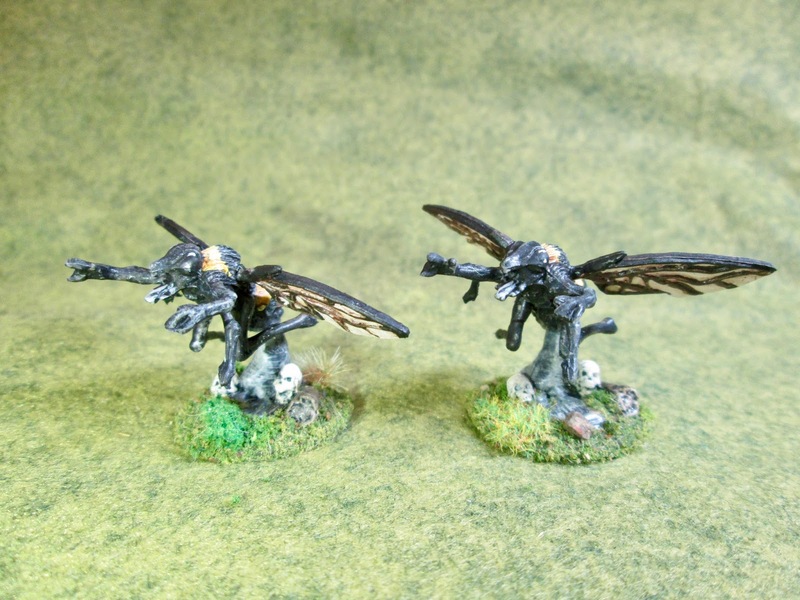 Then after everything had a while to dry, I gave their wings and the yellow stripes a wash with some thinned Winsor-Newton “Chestnut Brown” ink. When the wash was dry, I painted the top spine of each wing with Black and then painted the veins within each wing using some Accent “Real Umber mixed with Black. I then painted the center of each wing panel with the"Dove Grey”, and did highlights on the mouth and tongue(?) with Crafter’s Acrylic “Storm Cloud Grey”. Next, I repainted the eyes with Black to remove any drybrushing that got on them. After that, I drybrushed the yellow abdomen stripes with some Crafter’s Acrylic “Daffodil Yellow”, and lastly I did some White highlight dots in the eyes.. It was now time to work on the base. First, I drybrushed the the rocky outcroppings with the “Neutral Grey”, and then with some Folk Art “Porcelain White”. Next, I drybrushed the log with Americana “Raw Umber”, and then with some Americana “Khaki Tan”. Lastly, I painted the skulls with some Americana “Antique White”, and then drybrushed them with some Crafter’s Acrylic “Light Antique White”. I then worked on the bases; drybrushing the stones with Americana “Zinc”, then Americana “Neutral Grey”, and lastly Folk Art “Porcelain White”. After that, I drybrushed the log with Americana “Raw Umber”, then some Americana “Mississippi Mud”, and lastly, some Americana “Khaki Tan”. Finally, I drybrushed the skulls with some Americana “Antique White, and then some of the "Light Antique White”. I let the figures dry overnight and the next morning I gave them a coat of Americana “DuraClear Matte” varnish. When that was dry, I flocked their bases. Another overnight dry, and I sprayed them with Testor’s Dullcote". I’m generally happy with how these turned out. I think they made the conversion to giant bees pretty well. Nice work Cris, especially love the bases (I think bases are too often neglected and the ones that you do are always nice).